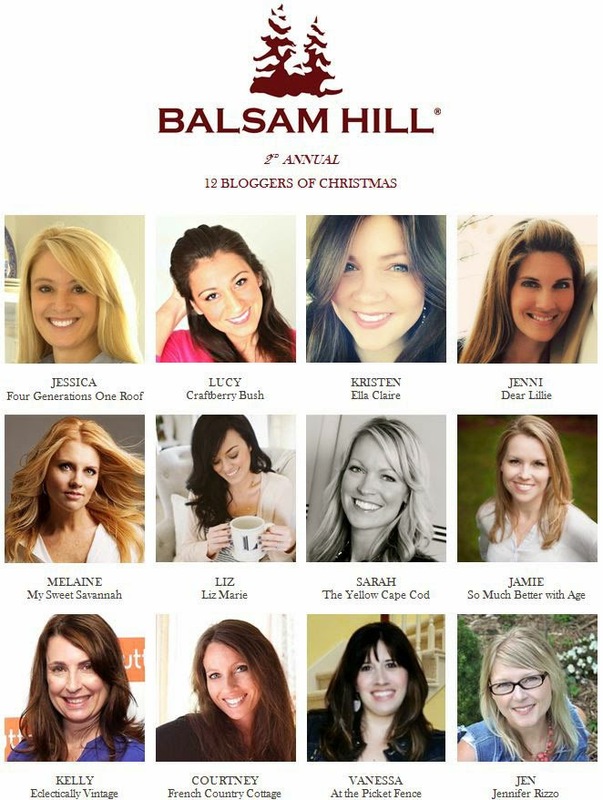 We are so excited to be partnering with Balsam Hill this Christmas as part of their Twelve Bloggers of Christmas! 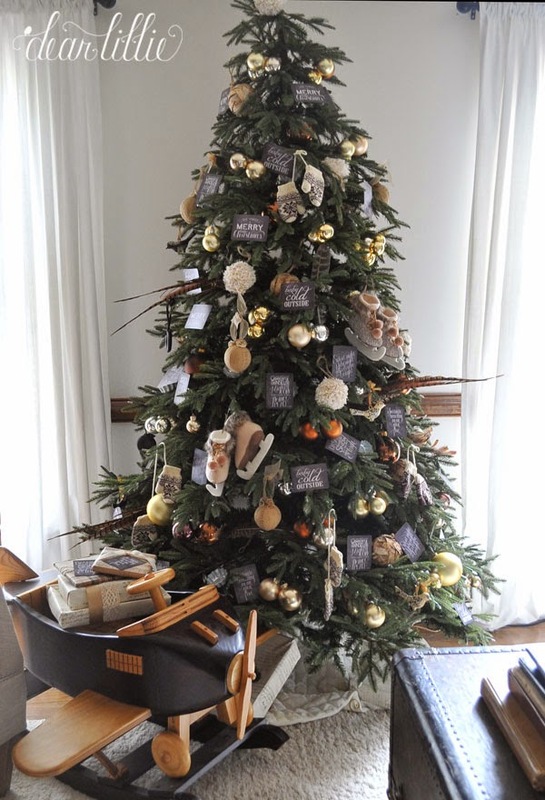 They let us choose a tree and I have to tell you it was a very difficult decision - there were so many fabulous ones to choose from! I went back and forth between a few but finally settled on this Brewer Spruce one and I am so happy with it! 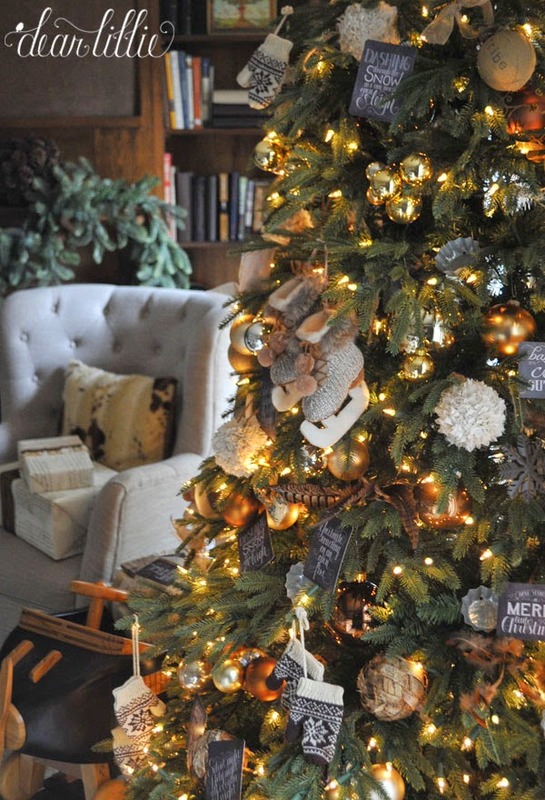 It looks beautiful and was so easy to put together and I love that it comes with a bag to store it in and fancy gloves to help fluff the branches out. 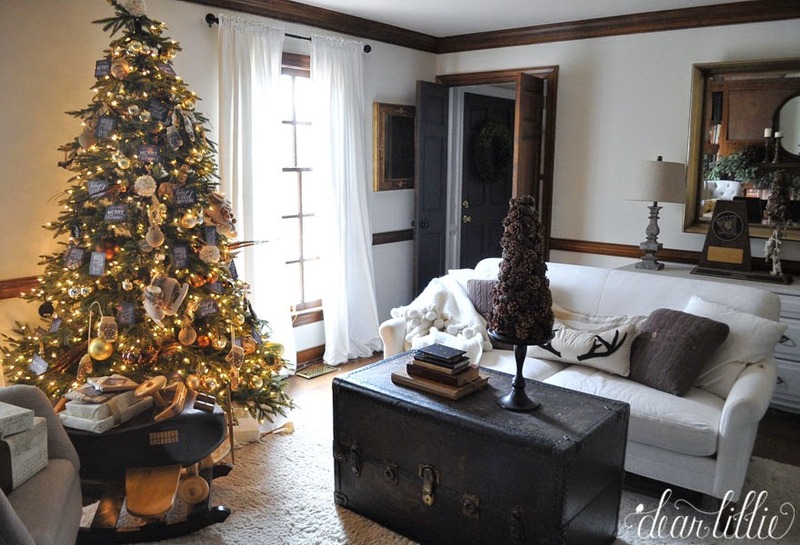 Because this room has all the dark paneling we stuck with a mostly brown and gold tree and mixed both rustic elements and cozy elements but threw in a few shiny ones too. 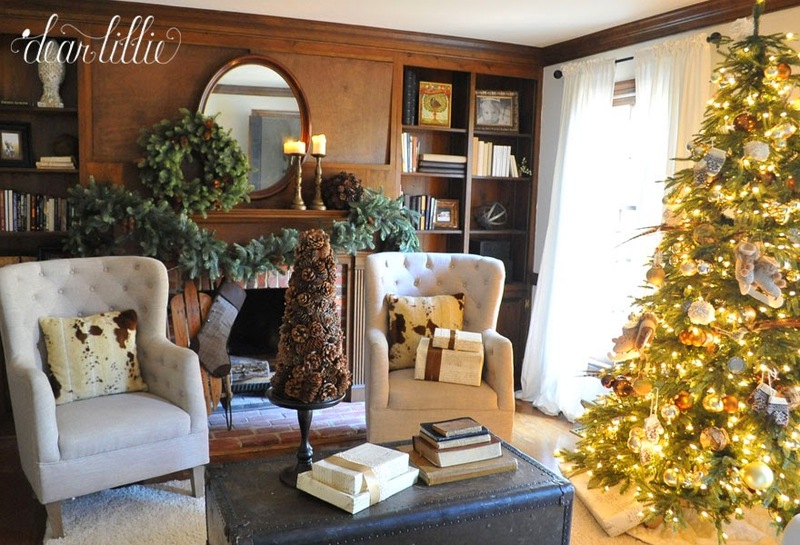 Clustering ornaments together like this can help make a statement. 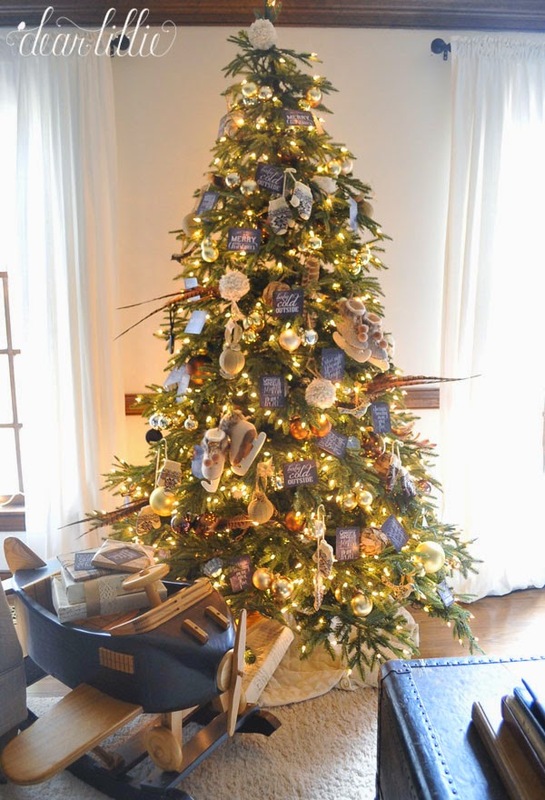 Our favorite new addition to the tree this year were these skates! They came in a set of two and girls LOVE them. 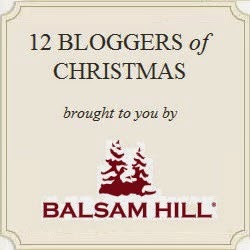 The stocking is from Balsam Hill as well! The garland and wreath are from Savvy Home and Garden and the candlesticks are from Hobby Lobby (probably close to ten years ago) and the pink cone sphere is from Pottery Barn (about eight years ago). 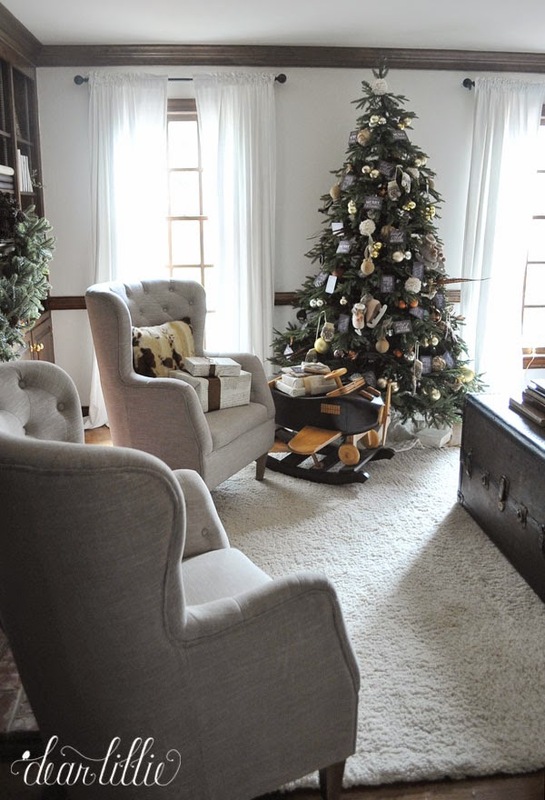 The mirror is a family antique and the sled is from an antique shop in New Hampshire. The plane was a gift from my aunt several years ago so I am not sure where it is from and you can find a more detailed source list for this room here. We are so excited about our new tree! And we are offering ours readers a discount code. The code offers you a special discount of $25 off any purchase of $200 or more, and it expires on 12/22. You can see all of their beautiful trees here. 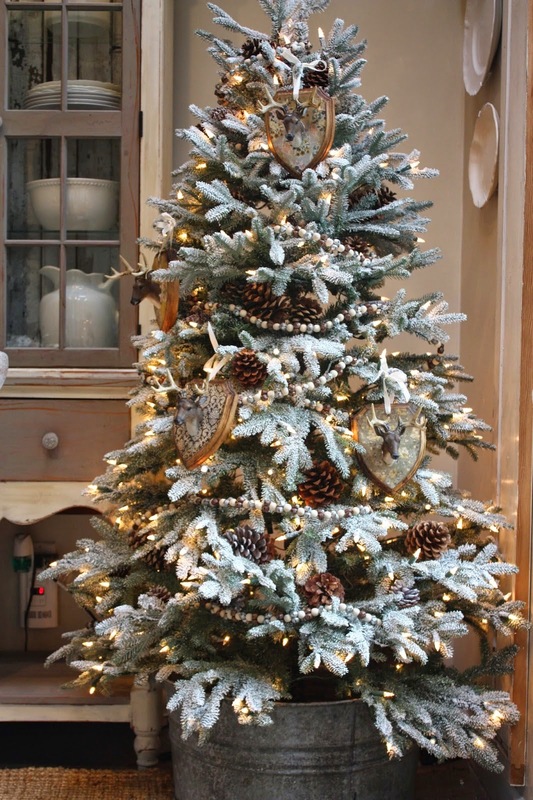 I really love this Frosted Fraser Fir! I'm pondering getting it for our family room next year. 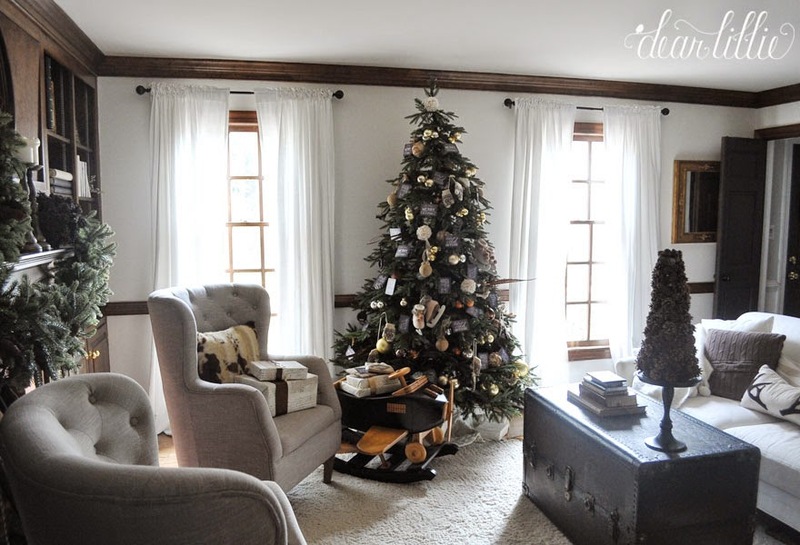 Make sure you head on over to Kristen's blog Ella Claire Inspired and see her stunning tree and you can see the rest of the list below. 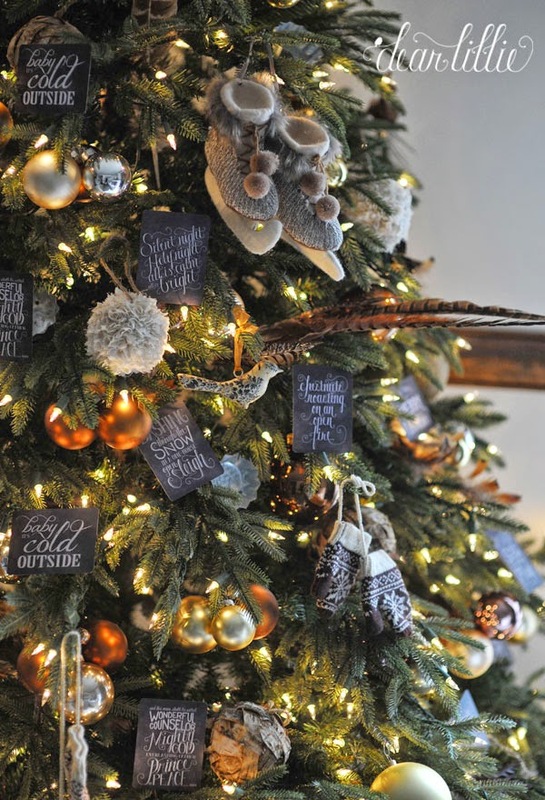 You can also see these other bloggers trees as well! It's gorgeous as always. Where did you get the little chalkboard ornaments? It is gorgeous as always. Where did you get the little chalkboard ornaments? Thanks, Jane! We designed them an sell them in our shop (www.dearlillie.com). They are currently out of stock but we hope to have them back by the end of the week. 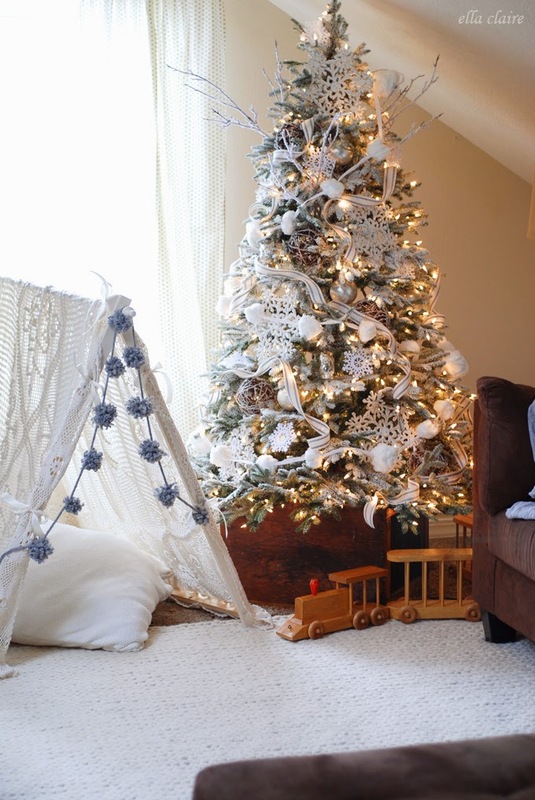 What a clever job you did marrying the dark paneling and the lighter walls and drapery in the focal point of your tree. I'm partial to the pheasant feathers that helped tie in a library type feel to the overall look. 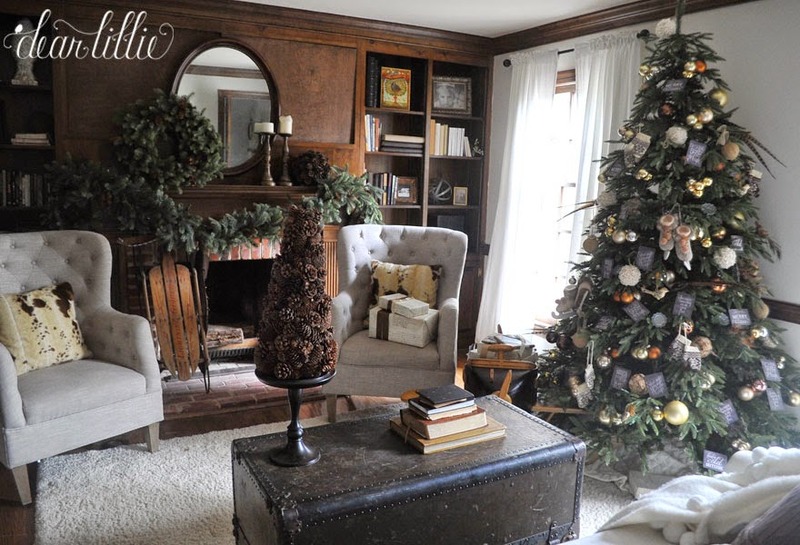 The ornaments blend well with the warm rich wood tones in the paneling, The greens on the mantel also look just stunning with natural pine cones and no fussy ness . 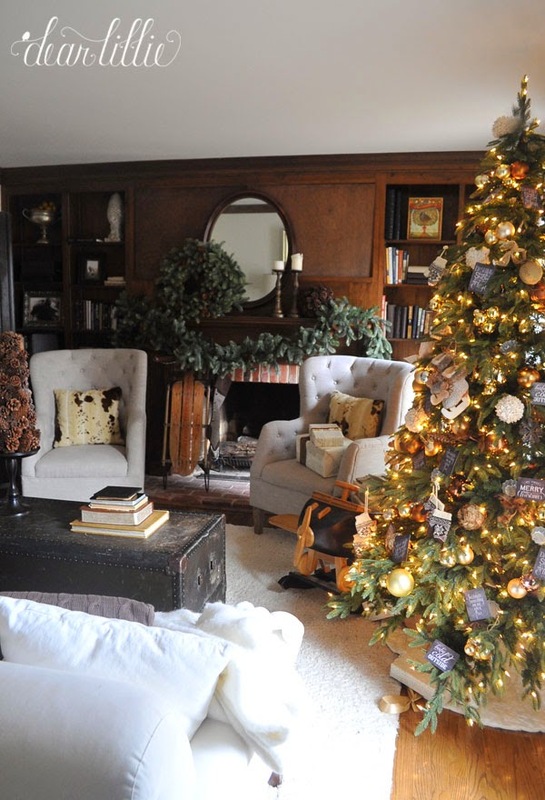 Thanks so much for decorating your Balsam Hill tree to go with the style of your own home and decorating that bring such a cozy and sophisticated look. 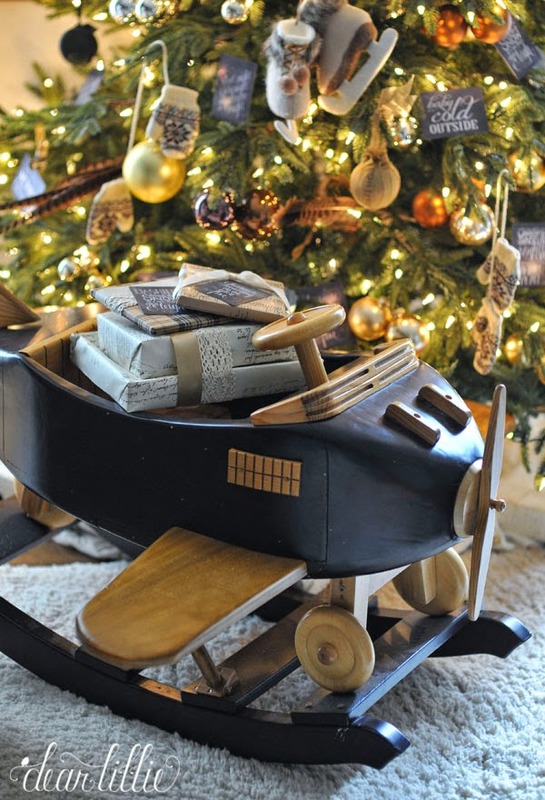 The sleigh and stocking really echo the library theme in the plaid. Love it. The Balsam Hill trees are so gorgeous and real-looking. 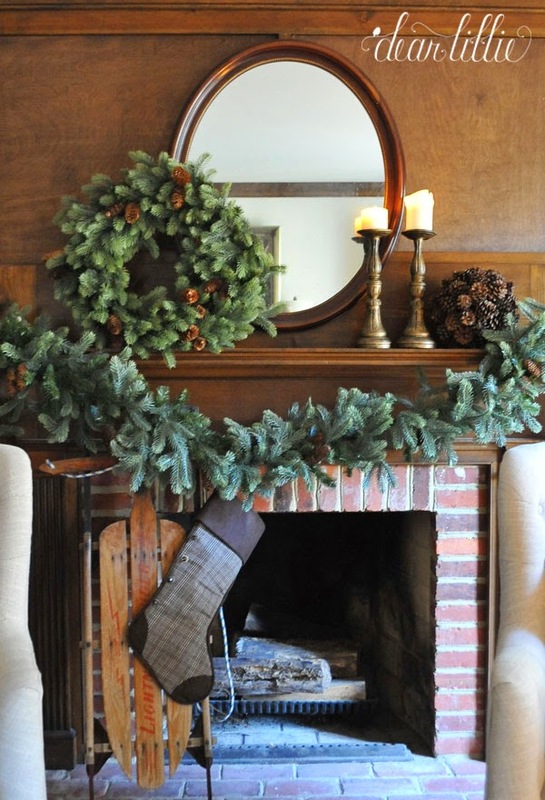 Your home is lovely for the holidays, and I especially love the mantel! I have followed you blog for some time now and have come to love you neutral color scheme throughout your house....to be honest when I read through the list of items in your family room and saw "PINK cone sphere"...I did a double take....thinking, whaaaaat??? Jenni used PINK in her family room?......aaaaahhhh.... "PINE cone sphere"! lol Happy Holidays! 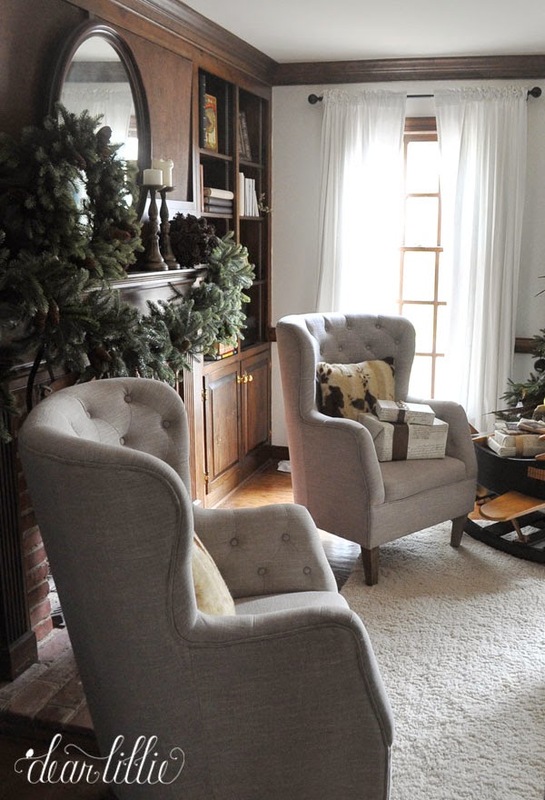 Where are the chairs from pictured in this post? Hi! They are from Savvy in Williamsburg. So gorgeous, Jennifer. 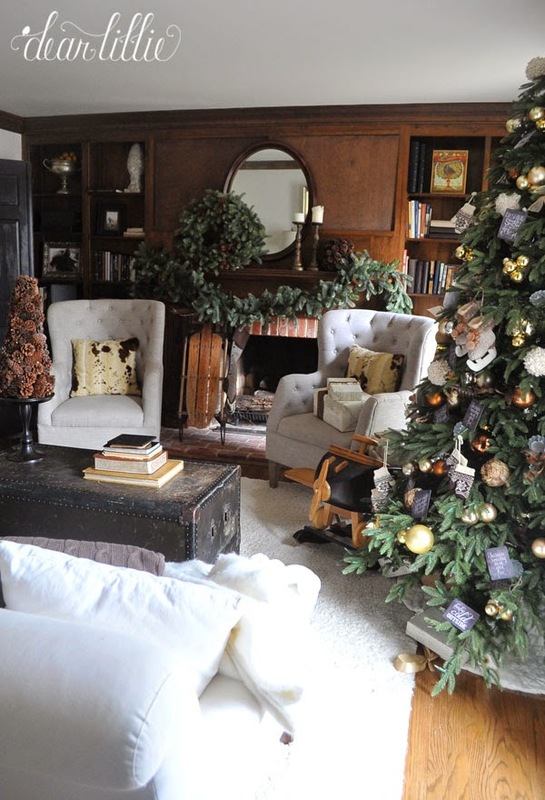 Of course I'm in love with your blog and every detail of your Christmas tours are impeccable. So fun being on this tour with you! 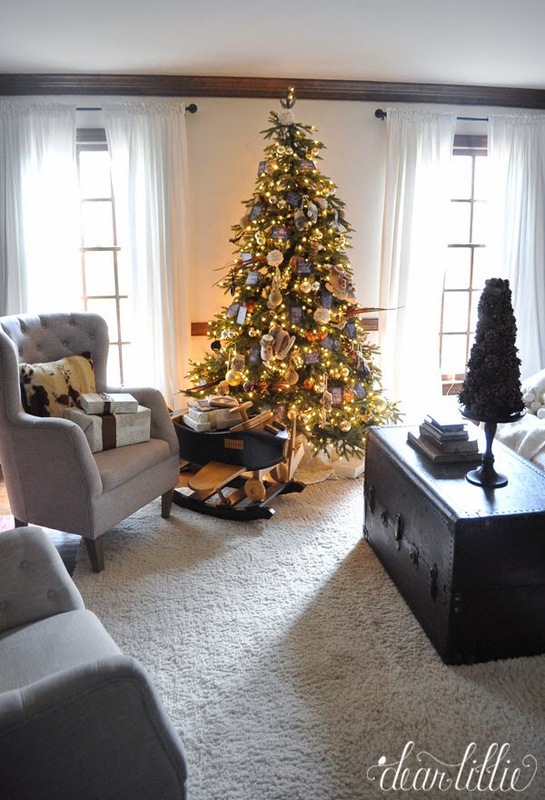 What a beautiful tree and room!! As always, you did an amazing job!! 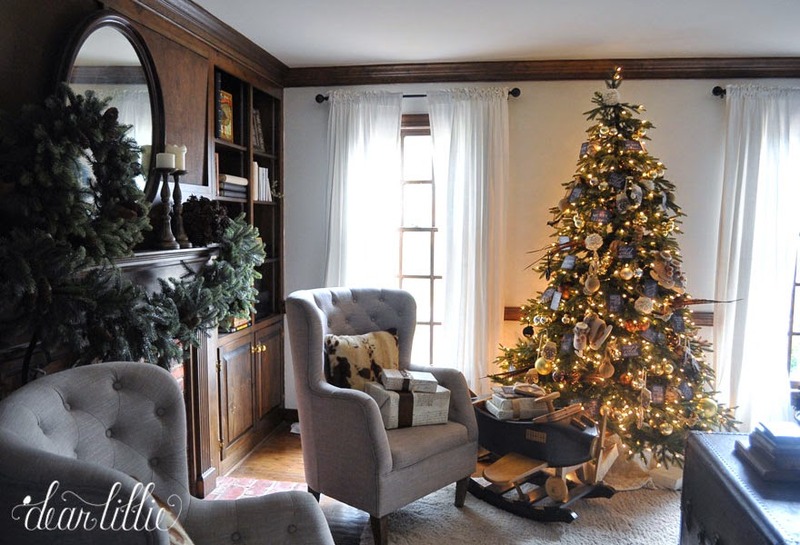 I was wondering if you can share how to hang your ornaments in clusters? I've noticed you've done that in the past years and wanted to find out how you do it. Thank you! Thanks so much! I just kind of run the ornament wire through all the tops at once so there's just one hook that loops them all together (if that makes sense). 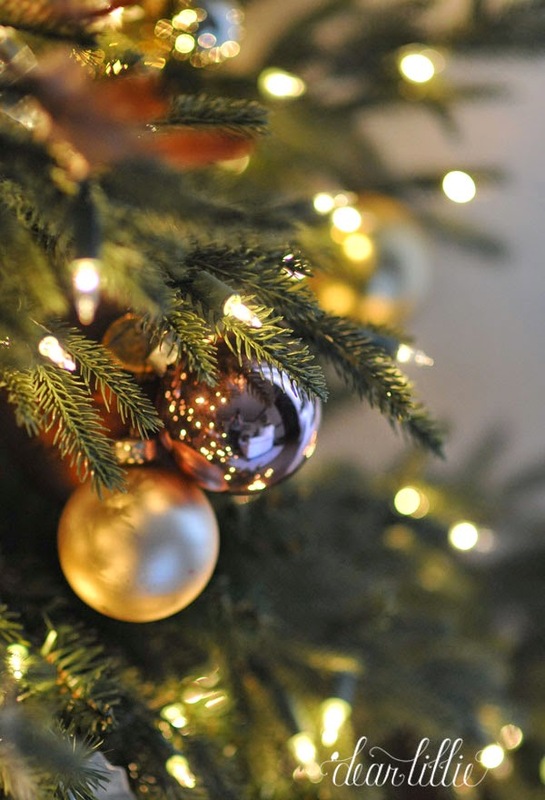 your tree is soooo cute! Thanks! 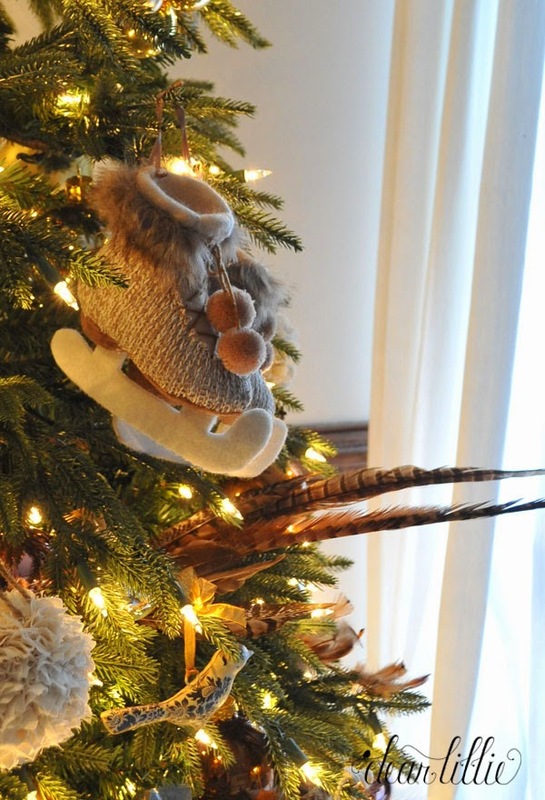 The skates are from Soft Surroundings (link above) and the chalkboard ornaments are from our shop.